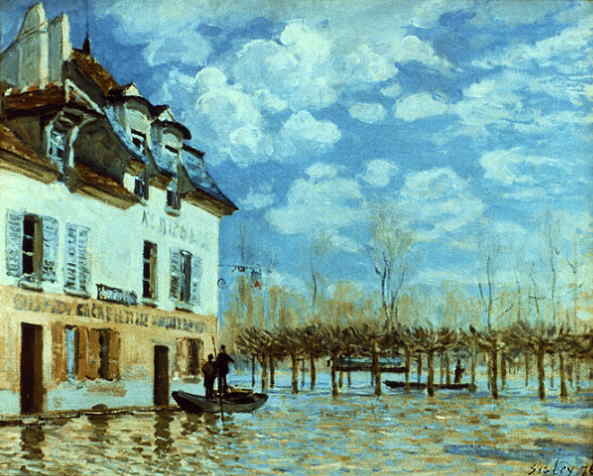 The unusually severe flooding at Port-Marly of February 1876 inspired Sisley to paint seven different paintings, one of which was exhibited in the third Impressionist exhibition of 1876. Since the end of the Franco-German war he had worked in several of the environs of Paris---at Louveciennes, Bougival, Argenteuil and Voisins but mainly at Marly. The collapse of the family business in the war had transformed the well-to-do young man under no urgent necessity to sell his pictures into a professional faced with as hard a struggle as Monet and Pissarro and braving it, fortunately, for a long time without detriment to his art. In these years he developed in freedom of style on somewhat similar lines to Monet but a particular grace and lyrical feeling were personal to Sisley. There is a hint of Corot in his sensitive treatment of the building shown, very French---if not especially Impressionist---in the pink and blue of its façade. The Impressionist habit of accepting as subject whatever they found in front of them often quite fortuitously produced an interest of composition as appears here in the perspective of poles and trees. Sisley's modest and retiring disposition may sometimes be traced in the undemonstrative nature of his art which is none the less of intrinsic value. In its quiet fashion this is one of the Impressionist masterpieces.